What was the plant installation brief? 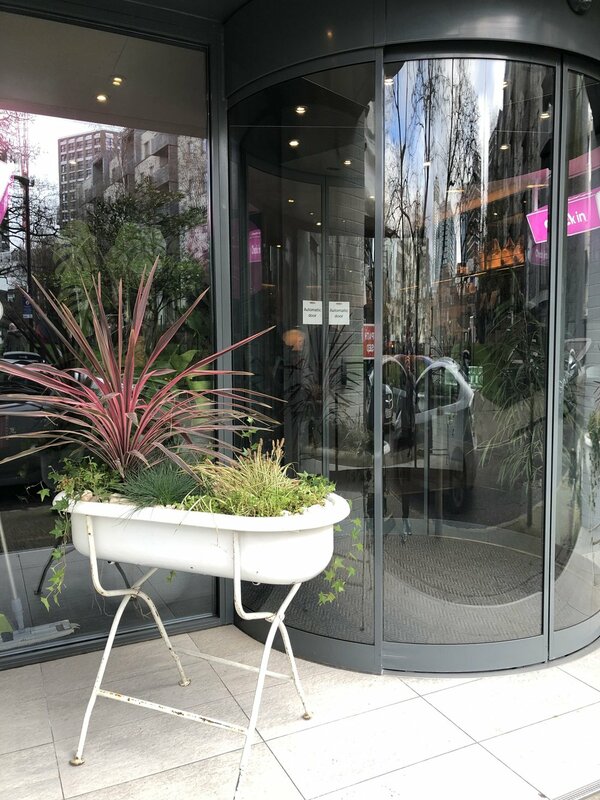 The QBIC hotel in Whitechapel have external large planters above their entrance that they were looking for someone to fill with hardy external plants. Ideally they wanted a little pink in the mix to bring out the brand colours and compliment the interiors as you walk inside. The hotel also wanted two large but unconventional planters for either side of their entrance. We took some vintage Victorian toddler baths and turned them into planters. Filling them with sedums, ivy and grasses. The pinkish Cordyline works well with the logo and internal branded signs. Exterior/Outdoor plant arrangement for QBIC hotels in Whitechapel, London. The large planter suspended above the entrance was filled with larger plants and variants of those used below. This help us to create a unified, but modern and slightly wild overall look. We loved the sedums that will begin to tumble and create that urban jungle feel. Looking for someone to help with outdoor planters and external planting plans? Fire us over a brief or ask us to pop over for a site visit and we will put a plan together for you.